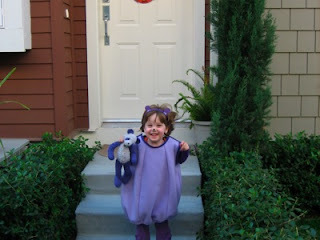 Elise was dressed in style for her first big-kid halloween party today. Making the ears and putting on the face paint were definitely the highlights of dressing. After awhile, it gets hard to keep up the act of being a bear, especially when some kid in a Spider Man mask runs up to you and tries to take toys away from you (or throw them at your head) so Elise didn’t stay in costume for long. Happily, the purple shirt she wore underneath her mommy-fashioned bear tummy has a Halloween type print on it so she is in costume regardless.